It should be common news by now that Apple has taken the decision to have an executive shake-up in Cupertino, with a number of notable faces set to leave the company in 2013. One of the most well-known casualties of the internal restructure is Scott Forstall who has held the role of Senior Vice President of iOS over the last few years. Forstall has been in charge of developing and handling the direction of iOS and has reportedly been shown the door due to his inability to play nice with other executives, as well as the publicly perceived shortcomings in the new Apple mapping system and the Siri digital assistant. 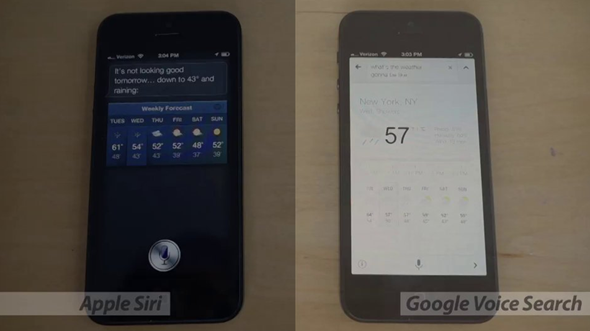 Siri has been a hot topic of conversation since it was first launched with the iPhone 4S, and that chatter is hotting up thanks to the launch of the updated Google Search app that is now available on the iOS App Store. Being able to give our smartphones audible commands is obviously a premium feature, and one that users will want to see grow as hardware and software advances, but what exactly happens when Apple’s digital assistant goes head-to-head against Google’s Voice Search? The attached video shows exactly that in terms of overall quality, performance and success of dealing with the actual request, and both services handled things quite well, although both Siri and Google Voice Search managed to get things wrong on some occasions. Asking about the weather on Siri returned sports scores in some instances, whereas enquiring about up and coming sports events led Google’s Voice Search to dig into the past to pull up some historic results. Anyone who has extensively used Siri over the last twelve months will be aware that the service can sometimes be excruciatingly slow, which is exactly what the head-to-head test revealed. Google’s service more often than not reacted to the command, found the desired information and returned the results a lot quicker than Siri. The seamless integration with web searches also makes the Voice Search features stand out, whereas Apple have gone against their normal seamless user-experience by making users actually have to tell Siri to go to the web for searches. It isn’t all doom and gloom for Siri. Having access to things like social networks, calendars and text messaging makes it a lot more powerful than Google’s offering. Both services obviously have their place on our devices, but we will hopefully see Siri become a lot more robust now that Forstall is leaving.